In his article, “The Hijacking of the Christian Faith by the Republican Party,” Daniel Arrey attempts to parallel Christianity with the principles set forth by the modern day Republican Party in an attempt to discredit conservative Christians. Mr. Arrey’s bio tells us that he is clearly a biased source having campaigned for now Senator Tom Udall in addition to being a grass roots organizer for now President Barak Obama, so his article, unfortunately, must be taken with a grain of salt. But as any good liberal Christian, he uses the model of health care reform to show how Christian Republicans are not truly Christian … he even hints at their ultimate spiritual demise for being Republican towards the end of his article (Remind me what Luke 6:37 states, Daniel). a political movement advocating a gradual and peaceful transition from capitalism to socialism by democratic means. In fact, let’s play on his terms and use this health care reform to show that supporters of health care reform are not liberals (by definition) but rather are social democrats. Liberalism advocates the freedom of the individual. This health care reform requires everyone to be insured whether they want it or not. It requires you pay into it, even if you have private insurance. That doesn’t promote individual freedom. Supporters of health care reform like to flaunt the fact that 32,000 people in America die each year from not having access to health insurance, yet they fail to note that the third leading cause of death in America (with a whopping 250,000 deaths per year) occur from physician and hospital error. There are a growing number of Americans who are seeking alternative forms of medicine because they have a better chance at living from year-to-year if they don’t have health insurance. So Daniel, why shouldn’t individuals have the right to refuse government health insurance and opt out of paying into a system they don’t plan on using? Liberalism, according to your definition, “guarantees the individual rights.” So why is the Democratic Party not guaranteeing an individuals’ right to opt out of this health insurance program? Liberalism also supports nonviolent modification of social institutions. If this health care reform reflected this belief, then why the need to hire tens of thousands of IRS agents (who act above the law and hardly in nonviolent matter)? Why the need to force penalties such as fine and imprisonment? Yes, Daniel! Liberalism does sound pretty nice … but this health care reform doesn’t sound like liberalism. But the most fatal error that he makes is using Holy Scripture out of context. While this is not uncommon for liberal Christians (sorry guys), it does pose a dangerous threat, one that Arrey reminds us about in his article; false prophets. The first Scripture provided is Luke 6:24, “But woe to you who are rich, for you have received your consolation.” While a superficial reading of this verse makes it sound like the rich are condemned simply for having money in their bank accounts, when you read the cross-references, you find that the context to be much different. Woe to you who are rich is a solemn warning to those who are rich against the tendency to delight in and trust the things of this life more than God. We also know from Scripture that it is the love of money, not money itself, not the possession of it, that is the root of all evil. (1 Tim 6:10). When one loves money more than God, they will find themselves condemned. Moreover when one loves anything more than God, they will find themselves condemned. But God does sometimes grant riches to the faithful. Psalms 37:4 states that if we take delight in God, that He will give us what we desire. This could of course come in numerous forms but wealth and property is indeed on them. Abraham, for example, was an incredibly wealthy man. It would be dangerous to speak out against the blessings bestowed on a person by God for their faithfulness – whether you agree with God or not. The Biblical marriage covenant is a contract between God and the couple marrying, it is God who has established who can enter into this contract. See Gen 2:23-24. So you can’t blame the Republican Party for this one. Also … it should be known that marriage is not a right – for anyone – even heterosexuals. Scripture states that taking the life of the innocent is a crime called murder; innocent meaning they have committed no crime. Science proves that life begins at conception and so abortion (both Biblically and scientifically speaking) is murder. So you can’t blame Republicans for this one either. And actually, there are also a number of groups headed up by non-Christians, even atheists, who are staunch prolifers and/or not a part of the Republican party. This one makes me giggle …. guns aren’t rights. They are cleverly designed hunks of metal consisting of a barrel, firing pin, and trigger, which when pulled, expel a small apparatus called a bullet. The purpose of guns are several, but the most popular being self-defense and killing game in order to eat. Self-defense is a God-given right; the pursuit of life-sustaining food is also a God-given right. Guns are simply a highly effective means of protecting those rights. And since in a republic the ultimate protector of rights is the individual, then we also have the right to obtain the means necessary to protect our rights. Get it? And actually it was your party’s founder, Thomas Jefferson, who stated: “The strongest reason for the people to retain their right to keep and bear arms is a last resort to protect themselves against tyranny in government.” So you can’t blame the Republicans for that one either. Just asking, but have you heard of a little something called The Great Commission? Matthew 28:18-20 And Jesus came and said to them, “All authority in heaven and on earth has been given to me. Go therefore and make disciples of all nations, baptizing them in the name of the Father and of the Son and of the Holy Spirit, teaching them to observe all that I have commanded you. And behold, I am with you always, to the end of the age.” So not only can you not blame the Republican’s for this one, but you’re going to have to speak to Christ himself about your problems evangelism and discipleship. I should also add this point, that Christians involved in the Great Commission generally know that conversion happens by the power of the Holy Spirit working through an individual, not an individual thumping another over the head with a Bible. Those were just a few … I could address all of them, but as you can see this blog is getting quite long. You see Daniel, our President MUST be a natural born citizen, and in a republic, the government is the servant of the people … in other words, Obama works for us, and just like business owners have a responsibility to verify the citizenship of potential employees, the citizens of America (Obama’s employer) also have a responsibility to verify the citizenship of this employee. So those people who are contesting his citizenship are well within their right to do so … no McCarthyism needed. The fact of the matter is, that the Christ – the Son of God – the Anointed One – the Righteous One – is too perfect to fit into any ideological mold that man can invent. 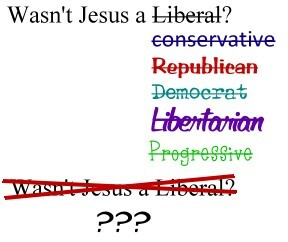 Christ is not a conservative; He is not a Republican; He is not a liberal; He is not a Democrat; He is not socialist, communist, populist, pacifist, progressive, libertarian, anarchist, community organizer … or whatever else you can come up with. Is Christianity being hijacked? Sure. But you can’t blame just the Republicans. In fact, I’d say that Daniel Arrey is attempting to hijack Christianity on behalf of liberals. Moreover, true Christianity has been under threat of hijack since the first century Gnostics. This is nothing new. Why? Because mankind has a fallen nature; in fact, you could even say we have an innate “God-complex,” because we want to believe that we are good enough for God (or even better than God), and when someone challenges us, we simply try to show why Christ would totally jump on our little grassroots bandwagon. People naturally want to think that they are on the side of good and not evil, and will go to great lengths to show their (self) righteousness. So be careful, Daniel, because you too run the risk of committing all the sins that you accuse conservatives of. You are a sinner too. Great post! It’s nice to have you blogging again–I enjoy reading your stuff.